John Boehner’s failure and Wayne LaPierre’s defiance are two signs of just how far the Republican Party has fallen. Why today was a very bad day to be Republican. 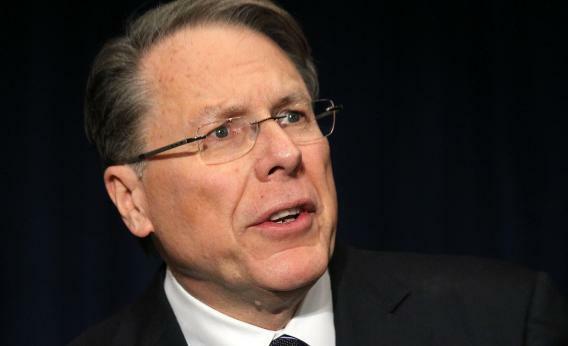 NRA Executive Vice President Wayne LaPierre calls on Congress to pass a law putting armed police officers in every school in America during a news conference Friday, Dec. 21, in Washington, D.C. It was the second defiant act by conservatives in 12 hours. The night before, a committed band of Republicans defeated House Speaker John Boehner. The Republican leader had offered legislation designed to give his party political cover in the fiscal cliff negotiations and increase his leverage in talks with the president. The gambit failed because enough Republicans refused to bend on their anti-tax principles. Boehner wound up looking foolish, and the House Republicans looked unable to perform the most basic functions. The Republican Party is in a rebuilding mode after its 2012 election loss. These two events—a defiant NRA and an incompetent leadership—cannot be the face of confrontation the GOP wants to show the public on high-profile issues. Tea Party activists and gun owners are a key part of the party base. But these public acts are out of sync with the moment and completely at odds with party’s need to widen its membership. The NRA and Tea Party conservatives would simply say that they are sticking to their principles. That presents two questions: whether their principles are wrong at this time in history and whether the way in which they stick to their principles damages the party. Let’s focus on the second question. The message of both of these acts is more than “we’re sticking to our principles.” The message is: We don’t care about the wider audience. That cannot be the message that the Republican Party wants. It particularly can’t be the message after Mitt Romney’s losing presidential campaign, which was defined by his secretly taped conversation with donors in which he said he didn’t care about 47 percent of the population. We know it’s not the message that its putative leaders want to send. Chris Christie, Bobby Jindal, Marco Rubio, and Paul Ryan are all trying to send various messages of inclusion. In the case of House Republicans, they are clearly defying broad public sentiment, which is that Congress should work out a deal with the president. A recent Washington Post/ABC News poll shows the public in favor of compromise and supporting the president’s view. (Seventy-six percent say the Republicans have not been willing to compromise enough.) The members who blocked Boehner have a different political calculus, however. Their voters reward them for their opposition to policies that don’t cut spending enough. Plus, ideological groups like Americans for Prosperity, the Club for Growth, and FreedomWorks can penalize them if they vote the wrong way because their districts hold read-to-run conservatives who will stay pure—just add money. But consider how this hurts the party. Let’s say you’re a principled conservative who disagrees with John Boehner. You’d like more people in the country to sign on to your way of thinking. To do this, you must persuade those people. You want to persuade them so they’ll vote for more Republicans who will give you a majority to enact conservative policies. But these persuadable people are sensitive. You can’t persuade them when they think you’re incompetent. The House Republicans’ performance on Thursday night qualifies for that description. The NRA response is a different matter. The NRA has been far more successful at working the system than House Republicans. So, as Dave Weigel points out, Wayne LaPierre was backing a position on Friday that at least has the popularity of the assault weapons ban the president is pushing. This Gallup poll asked Americans how to prevent the next massacre. Sixty-four percent wanted “at least one person” at every school to be armed, and 87 percent were open to more “police presence” at schools. But the question at hand is whether the defiant tone of the NRA event will be as popular as those policies. For most people, the post-Newtown public conversation has had some element of self-reflection. The president, NRA-supporting politicians, and Hollywood have all taken a step back and examined their views. Most have recognizing that they need to at least modify their positions in some ways. Even if no one changes their tune ultimately, the participants have at least nodded to the possibility that a decent respect for the opinions of others requires sensitivity to opposing positions. The NRA did not go this route. It was calling for a conversation but it was starting an argument. LaPierre blamed culture—movies, video games, and music—for a mass shooting but wasn’t willing to even brush up against considering what role guns might play. That is where the interests of the NRA and the GOP separate. A full-throated argument with President Obama helps the NRA by riling up its members who write big checks. This, in turn, provides money to keep lawmakers in line. For a national party so closely aligned with the NRA, this poses a challenge. Right now its leaders are trying to send the message of inclusiveness in all forms. The Republican Party has lost the popular vote in five of the last six elections. Something has to change. The precise road back to the majority is not clear. But as a matter of basic math, it’s pretty clear that the party must show that it is open: open to ideas, new people (i.e., minorities who are growing as a larger share of the voting population), and the new challenges of our daily lives. Holding more firmly to your views despite new circumstances can offer stability, but it also opens you up to looking remote, unconcerned, and out of touch. To those who might think you hail from another planet, it helps to speak to them in their language. That language requires a conversation, not an argument. It is a virtue to stay true to your principles. But the great patron saint of conservatism, Ronald Reagan, knew that you had to do it in a way that didn’t offend people. Reagan had plenty of critics, to be sure. Clark Clifford famously called him an amiable dunce, but even that cheap shot allowed for the fact that he was amiable. There is nothing amiable in these recent public stands by conservatives. It can’t be true that a party returns to national greatness on an anti-amiable platform.